The new Mercedes-AMG E 63 4MATIC+ and Mercedes-AMG E 63 S 4MATIC+: The most powerful E-Class of all time from a 4.0-litre 612hp (450kW) twin-turbo V8. Mercedes-AMG is redefining the performance saloon. The brand is turning the most intelligent executive saloon into the most powerful E-Class of all time in the shape of the next generation of the E 63 4MATIC+ and E 63 S 4MATIC+. Mercedes-AMG is also setting new benchmarks in this market segment with its innovative technologies. The intelligent drive strategy raises the limits of the performance saloon's vehicle dynamics to a completely new level. Delivering superior acceleration, the 4.0-litre twin-turbo V8 engine generates up to 450 kW (612 hp). This makes it the most powerful engine to have ever been installed in an E-Class. At the same time it is even more efficient thanks to a cylinder deactivation system fitted as standard, and thus sets the benchmark in its segment. With acceleration of 3.4 seconds from 0 - 100 km/h the new business limousine is at the top of its class. The AMG SPEEDSHIFT MCT (Multi Clutch Technology) nine-speed sports transmission is combined with a wet start-off clutch for the first time. This enabled more agile response times to be achieved. Another highlight is the completely new AMG Performance 4MATIC+ all-wheel drive system. It combines the advantages of various drive configurations. Torque distribution on the front and rear axles, which until now was strongly rear-biased, is fully variable for the first time. This ensures optimum traction right up to the physical limit, whatever the road conditions. The expressive exterior design, featuring a new radiator grille and coupé-style inset bonnet, underlines the performance figures. 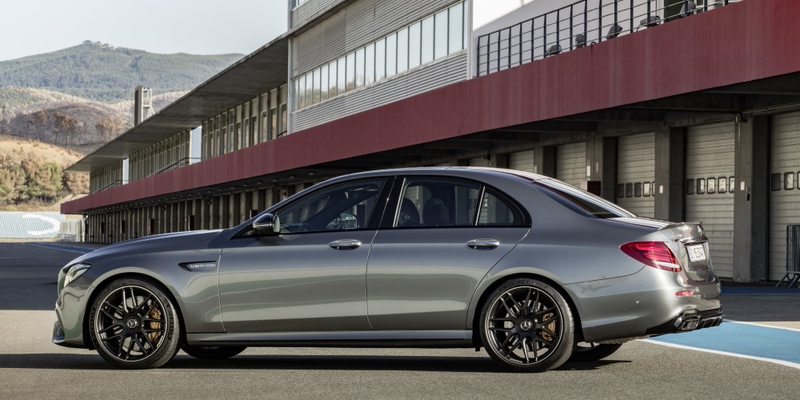 The next generation of the E 63 thus offers a completely new level of sportiness and comfort on long journeys. "The new E 63 models represent the biggest step forward we've ever taken from one generation to the next. Vehicle dynamics were especially important to us. At the start of the development process, we opted for a fully variable all-wheel drive system which, when combined with the advanced performance of the 4.0-litre twin-turbo V8 engine, reaffirms our brand's "Driving Performance" claim," explains Tobias Moers, Chairman of the Board of Management of Mercedes-AMG GmbH. Every detail of the exterior and interior is designed to enable AMG Driving Performance to be experienced at first hand. The expressive exterior design is all about sinuous edges and defined muscles. With a completely distinctive design forward of the A-pillar, the sporty front also demonstrates the effort that Mercedes‑AMG has put into the styling: For the first time on an AMG saloon, the bonnet is inset between the wings and bumper like on a coupé, thus exhibiting an entirely new, more dynamic approach to the sculpting. More powerful-looking and 17 millimetres wider, the wheel arches accommodate the greater track width and the larger wheels on the front axle. The new radiator grille with twin louvres in silver chrome, vertical black struts and "AMG" lettering likewise emphasises the distinctive look. A wide front apron inspired by the design of a jet wing, with flics in black and a large front splitter, impressively epitomises the power of the new models. It also showcases the sophisticated cooling technology - a typical feature from motorsport and another visual reference to the powerful engine. The two louvres in the outer cooling-air intakes also help in this regard, their targeted wing profile directing air to the wheel arch coolers.